The concept of job burnout was introduced in the early 1970s and Freudenberg presented it academically and technically in 1974. However, job burnout is seen more or less among employed individuals. Unfortunately, as regard to this fact that most of the organization's managers and staffs have no clear definition of this phenomenon and its causing factors and no exact criterion has been presented for it. When a person is affected by such a problem in the organization and its effects are illustrated in his actions and emotions, others call him/her "mad." This tag would lead to the increasing intensity of this problem, having negative attitude toward self, others, job's conditions and even the job itself which in turn would result in different mental and physical illnesses. Self-efficacy has a determining role on individuals self-motivation, because S.E. belief affects the selection of goal challenges, the amount of attempt made in doing tasks, the amount of persistence and perseverance in facing with problems, and the amount of tolerance of pressures. The experiences resulted from the staffs' success or failure in the in-service years impact on their beliefs about their abilities in fulfilling the occupational tasks. Usually, people search activities and situations which they enthusiastically inclined towards them with which they feel they can match themselves, while they avoid those activities and situations, which they think they cannot cope with Marshal Rio. Given the forementioned explanations, it should be noted that the researchers interest, enthusiasm and perseverance are also influential in reaching the superior goal of this research, - which was the effective relationship of EI, S.E. and job burnout. Since every organization's attempt is to maximize the efficiency and quality of output and results achieved from that organization's process, this goal should be seriously pursued in education organization, too. The final goal of this organization is to train skilled and professional individuals in different areas. To achieve this goal, the presence and existence of motivated and energetic teachers is necessary. One of the influential factors on teachers motivation which the current research is investigating it is their EI and S.E. That is, whether EI and S.E. have any effect on teachers job burnout or there is no significant relationship between these three variables. Regarding the dimensions of burnout which include physical burnout, emotional problems and attitudinal burnout, the dimensions of the 2 intended variables (EI and S.E.) try to make a productive power, which could organize the humans cognitive, social, emotional and behavioral skills to effectively achieve the goals. In other words, they try to decrease the burnout and its related dimensions. Nowadays, regarding the necessity of social changes, education is considered as one of the complex and big social organizations of every country and has an inseparable link with social, cultural and economic growth and development and has gradually moved from a primitive simple state to a complicated state. The effectiveness of education is transforming the talented humans to healthy, balanced, motivated and mature one in one hand, and providing the needs of society's human resources in different cultural, social and economic areas on the other hand. Teachers are the link between educational system and students and the success of instructional programs complied in the educational system is to a large extent due to the teachers S.E. Therefore, by investigating this factor we can take a big step towards fulfilling the superior goals of education. In the present study, the three intended variables were investigated under the title of "the effect of EI on primary teachers job burnout at Babol city, with S.E. as the mediator variable." The independent, dependent and mediator variables of this study are EI, job burnout, and S.E., respectively. Does teachers EI have a direct, positive and significant effect on their S.E.? Does teachers EI have a direct, negative and significant effect on their job burnout? Does teachers EI with mediating role of S.E. have indirect, negative and significant effect on their job burnout? Based on the purpose, this research is practical since its results are applicable for all organizations and educational and research systems, especially education and schools. Based on how to gather the required data, it is descriptive and correlational in which the relationships between variables are analyzed according to the research purpose. Schutte  EI questionnaire: It consists of 33 items and assesses three variables of emotion evaluation and expression, emotion regulation and emotion exploitation on a 5-points Likert scale (from 1 to 5). In the research, the reliability of instruments has been achieved through Cronbach's alpha for job burnout, EI, and S.E. questionnaires as 0.86, 0.91 and 0.92, respectively. These numbers indicate that questionnaires are reliable to assess the validity of questionnaires, content validity and construct validity were applied. Content validity was determined by experts and construct validity was done through confirmatory factor analysis. The data were analyzed by Spss Version 20 IBM company and Lisrel Version 8.5 Scientific Software International. statistical Software. To ensure the suitability of data to be used in this research, Kaiser and Meyer and Olkin (KMO) goodness of fit (GFI) test and Bartlet test were done. The amount of KMO test is 0.811 (KMO > 0.5) and the amount of Bartlet test is 8082.250 (P < 0.01) that indicates the GFI of sample and entered variables to do factor analysis. Confirmatory factor analysis is used to assess the validity of measurement scales  and confirmatory factor analysis estimates the amount of GFI of the model with data. The results of confirmatory factor analysis for S.E. showed that factor loads of all items of the intended instrument are above 0.3 and they are in good state. Also, the fitness indices resulted from performing confirmatory factor analysis of S.E. after modifying the model indicate the suitable validity of the instrument (χ2 = 675.28, degree of freedom [DF] =249, P = 0.000, root mean squared error of approximation [RMSEA] =0.088, χ2 / DF = 2.711). The results of confirmatory factor analysis for job burnout showed that factor loads of all items of the intended instrument is above 0.3 and they are in good state. Also, the fitness indices resulted from performing confirmatory factor analysis of job burnout after modifying the model indicate the suitable validity of the instrument (χ2 = 450.33, DF = 374, P = 0.000, RMSEA = 0.078, χ2 / DF = 2.337). The results of confirmatory factor analysis for EI indicated that factor loads of items 4, 5, 28, and 33 of the intended instrument was <0.3, and hence these items were deleted from the model. The results of confirmatory factor analysis after deleting these items showed that all the factor loads and significant numbers related to the models parameters were in good state and the fitness indices resulted from performing confirmatory factor analysis of EI after modifying the model indicate the suitable validity of the instrument (χ2 = 450.33, DF = 186, P = 0.000, RMSEA = 0.080, χ2 /DF = 2.421). The purpose of this research is to investigate the effect of EI on primary teachers job burnout with the mediating role of S.E. In so doing, the relationships between composing variables of EI, S.E. and job burnout will be reported through Pearson correlation. Then the results of performing structural equation modeling (SEM) will be reported. As can be seen in [Table 1], all the observed variables are correlated with each other at %1 level of significance. According to [Table 1], the highest observed correlations were related to the relationships between EI and emotion exploitation (0.915), S.E. and class management (0.910), S.E. and teaching methods (0.890), S.E. and involving learners (0.881). The lowest observed correlations were related to the relationships between involving the learners and depersonalization (0.138), emotion regulation and emotional exhaustion (0.198), emotion evaluation and depersonalization (0.202). As reported, all the existing correlations are significant (P < 0.01). This means that all variables have mutual relationships. Also, the negative mark indicates the reveres relationship between variables. In other words, the increase in the amount of emotion regulation would decrease the emotional exhaustion. Research hypotheses will be examined in this section. To test the hypotheses and suggested model that is, investigating the relationship between EI and job burnout with S.E. as the mediator, the gathered data were analyzed through SEM. The results are illustrated in [Figure 2]. As you can see, the general indices of GFI test in SEM indicate the overall fitness of the suggested model. Therefore, our data have well confirmed the suggested model and the general structure of the relationships under investigation was confirmed through obtained data (χ2 = 42.31, DF = 24, P = 0.000, RMSEA = 0.059, GFI = 0.96, adjusted GFI = 0.92, χ2 / DF = 1.762). The produced indices of SEM are not limited only to general GFI indices of the model. Also, There are standard parameters of β and ϒ (path coefficients) and T-values corresponding to it for each of causal paths of exogenous variable EI to endogenous variables job burnout and S.E. (gamma coefficients) and from the path of latent mediating variable of S.E. to latent endogenous variable job burnout (beta coefficient) that should be interpreted. These coefficients and indices indicate the relative power of each path. As can be seen in [Figure 2], the highest coefficient is related to the path from EI to S.E. (0.56). Then, form EI to job burnout (-0.32), and after that, form S.E. to EI (-0.28). Results of performing significance test of T show that all the path coefficients of β and ϒ are significant (P < 0.01). Along with examining the general GFI indices and coefficient of beta and gamma, examining the λy and λx coefficients is important. In [Figure 2], λy amounts indicate factor loads of latent variable of job burnout and S.E. Here, the highest λy is from S.E. 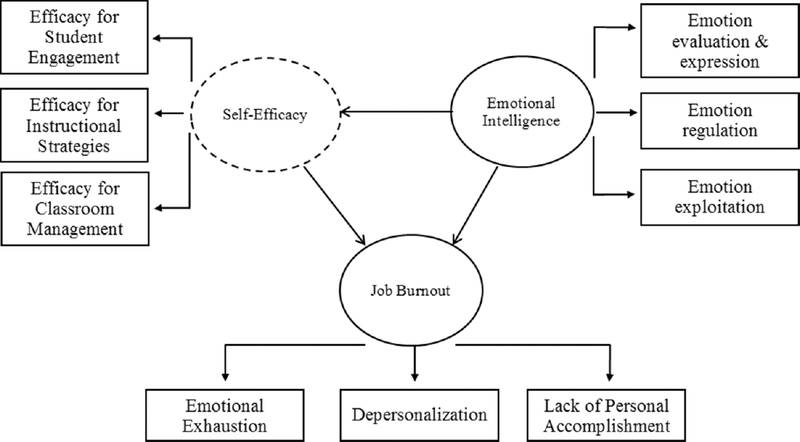 to class management (0.43) and the lowest λy are form job burnout to depersonalization and from S.E. to involving the students (0.37). As can be seen, all the λy coefficients are average amounts. T-significance test shows that all the obtained coefficients are significant (P < 0.01). Also, in [Figure 2], λx amounts (factor loads of latent variable of EI) show that the highest λx is from EI to emotion exploitation and emotion evaluation and expression (0.38) and the lowest λx is form EI to emotion regulation (0.28). As can be seen, all the λx coefficients are weak amounts. T-significance test shows that all the obtained coefficients are significant (P < 0.01). With regards to the output of research conceptual model and the output of multi-dimensional correlation, it was found that 29% of teacher's job burnout changes is determined by EI and S.E. of teachers in the following, research hypotheses will be examined. Teacher's EI has direct, positive and significant effect on their S.E. As can be seen, structural equations are used to investigate the effect of EI on S.E. of primary teachers of Babol city. Regarding the standard path coefficients (0.56) and T-significance index (7.51) of EI to S.E. in [Figure 2], it can be concluded that EI has direct, positive and significant effect of S.E. Also, according to bellow equation, the amount of multi-dimensional correlations between EI and S.E. is 0.31. It means that EI determines 31% of S.Es changes. Teacher's EI has direct, negative and significant effect on their job burnout with regards to the standard path coefficients (-0.32) and T-significance index (-2.99) of EI to job burnout in [Figure 2], it can be concluded that EI has direct, negative and significant effect on teacher's S.E. Teacher S.E. has direct, negative and significant effect on their job burnout. According to the standard path coefficients (-0.28) and T-significance index (-2.69) of S.E. to job burnout in [Figure 2], it can be concluded that S.E. has direct, negative and significant effect on teacher's job burnout. Teachers' EI with the mediating role of S.E. has indirect, negative and significant effect on their job burnout.Regarding the standard path coefficients of EI to S.E. and S.E. to job burnout (0.56 and -0.28, respectively and -0.16 as a whole) and T-significance index (-2.67) in [Figure 2], it can be concluded that teachers' EI with S.E. as mediator has indirect, negative and significant effect on their job burnout. This research aimed to investigate the relationship between EI and S.E. with job burnout of primary teachers of Babol city. These relationships were tested through both Pearson correlation and SEM and path analysis. The results showed that all the model's observed parameters in the latent variables are mutually correlated. The highest amounts of correlation are related to the relationship between observed variables of EI, emotion exploitation and S.E. together (engaging the students, instructional strategies, and class management). According to the other findings of the research, S.E. has direct, negative and significant effect on job burnout. It is in line with the findings of Amini and Verissimo. , However, in Aghdmi's research S.E. has negative and significant relationship with only lack of personal accomplishment and has no significant relationship with other variables. Teachers with higher S.E. can better match themselves with students and answer better to their specific needs. High S.E. can lead to some behaviors on the part of teachers, like spending more time in the class, more innovation in designing educational programs, suitable class management, and the application of those teaching methods which are more compatible with students' characteristics. Based on the main finding of this research, the effect of the mediating role of S.E. in the relationship between EI and job burnout of primary teachers of Babol city is negative, indirect and significant, but this amount is less regarding the direct effect of EI on job burnout. Based on the results of different researches, it can generally be said that people with high EI can use their total potential capacities and change limitation to opportunity. Surely, these people are positive characters and in their life and job situations can achieve successes that will effect on their happiness. Enhancing the spiritual status of teachers through mass media. Since the research sample was limited to public primary school teachers of Babol city. It is probable that the school type (public or private) and the place of service (city or village) be effective on the amount of job burnout. Hence, it is suggested that these factors be considered in similar future studies. Noori M. Investigating the Relationship Between Teaching Qualities of Primary Teachers with their S.E in Natural Sciences Course with Emphasis on Flandez Method. M.A Thesis. Islamic Azad University, Tabriz Branch, Faculty of Training Sciences; 2009. Zarei H. Inrestigating the Relationship Between Control Source with Job Stress and Job Satisfaction of Teachers. M.A Thesis. Tabriz University; 2002. Gary DA, Lawrence JS, Antwanette NH. Teacher burnout and perceptions of a democratic school environment. Int Educ J 2003;4:108-120. Friedman IA. Student behavior patterns contributing to teacher burnout. J Educ Res 1995;88:281-9. Kim MY, Lee JY, Kim J. Relationships among burnout, social support, and negative mood regulation expectancies of elementary school teachers in Korea. Asia Pac Educ Rev 2009;10:475-82. Freeman H. Emotional Intelligence at the Sheratonstadio city; 2003. Available from: http://www.sixeconds.com. [Last accessed on 2013 Sep 6]. Nasrollahpoor KH. The Effect of E.I and Talking to Oneself on Solutions for Facing with Stress in Shiraz University Students. M.A Thesis, Unpublished, university of Shiraz; 2007. Salaski M, Gartwright S. Health, performance and emotional intelligence: An explovatory study of retail managers. 2002;8:63- 68. Goleman D. Emotional Intelligence: Why it Can Matter More Than IQ. London: Bloomsbu; 1995. Schutte NS, Malouff JM, Hall LE. Development and validation of a measure of EI. Pers Individ Dif 1998;25:167-77. Ebrahimi B. Emotional Intelligence and General Intelligence. Tehran: Bija; 2006. Narimani AM, Berahmand TM, Gharamaleki NS. Relationship between EI with S.E and mental health and comparing it between talented and ordinary students. knowledge Res Psychol 2008;8:107-22. Mohamadi FS, Asadzadeh H. Testing the mediating role of teachers′ self-efficacy beliefs in the relationship between sources of efficacy information and students achievement. Asia Pac Educ Rev 2012;13:427-33. Hergnhan B, Arvalson M. Learning Theories. Translatated by Seif AA. Tehran: Doran Publication; 2007. Tsouloupas CN, Carson RL, Matthews RA. Personal and school cultural factors associated with the perceptions of teachers′ efficacy in handling student misbehavior. Psychol Sch 2014;51:164-80. Abdollahi B. The Role of Self- Efficacy empowering the staff. Academic monthly. Of management teaching: Tehran, Iran. 17 th year. No,168; 2006. p.36-38. Bandura A. Cultivate self-efficacy for personal and organizal effectiveness, Handbook of Principles of Organization Behavior. Oxford, UK: Blackwell; 2000. p. 120-9. Bandura A. Guide for constructing self-efficacy scales. In: Pajares F, Urdan T, editors. Self-efficacy Beliefs of Adolescents. New York: H. H. Freeman; 2006. p. 307-37. Yenice N. Search of science teachers′ teacher efficacy and self-efficacy levels relating to science teaching for some variables. Procedia Soc Behav Sci 2009;1:1062-7. Chan DW. General, collective, and domain-specific teacher self-efficacy among Chinese prospective and in-service teachers in Hong Kong. Teach Teach Educ 2008;24:1057-69. Armor D, Conry Oseguera P, Cox M, King N, Mc Donnel L, Pascal A, et al. Analysis of the School Preferred Reading Program in Selected Los Angeles Minority Schools (Report No, R-2007-LAUSD). Santa Monica, CA: RAND; 1976. Baher AA, Ostadi SN, Livarjani SH. Relationship Between S.E and E.I with J.B Among the Staffs of Islamic Azad University, Tabriz Branch. Training Sciences, 2 nd year, No: 7; 2009. p. 99-119. Verissimo R. Emotional intelligence, social support and affect regulation. Acta Méd Port 2005;18:345-52. Lee H. The Relationship Between Emotional Intelligence and Emotional Labor and its Effect on Job Burnout in Korean Organization. (Ph.D. dissertation), Minnesota State University; 2010. Adeyemo DA, Ogunyemi B. Emotional Intelligence and self-efficacy as predictors of occupational stress among academic staff in a Nigerian university. Niger J Clin Couns Psychol 2008;7:135-56. Linda G, Jan LD, Antoine BV. Emotional intelligence and adaptive success of nurses caring for people with mental retardation and severe behavior problems. Ment Retard J Pract 2004;42:106-21. Prati M, Liu Y, Perrewé P, Ferris G. Emotional intelligence as moderator of the surface acting - Strain relationship. J Leadersh Organ Stud 2009;15:368-80. Mcqueen AC. Emotional intelligence in nursing work. J Adv Nurs 2004;47:101-10. Yousefy AR, Ghassemi GR. Job burnout: Psychiatric nurses versus non psychiatric nurses. East Mediterr Health J 2006;12:662-9. Ehyakonande M, Shafiabadi A, Soodani M. Investigating the relationship between E.I and Its parameters with J.B of Married staffs of Islamic Azad University, Behbahn branch, organizational and occupational consulting periodical, 4 th cycle, No. 11; 2012. p. 66-77. Beyrami M. Investigating the effectiveness of E.I on self-expression, S.E and mental health of students. Academic research psychology periodical of Tabriz University. brd year, No 11; 2009. p. 25-42. Ahmadi E, Seikhalizadeh S. The relationship between burnout and emotional intelligence. J Think Behav 2006;1:49-56. Rastegar M, Memarpour S. The relationship between emotional intelligence and self-efficacy among Iranian EFL teachers.International Journal of Educational Technology and Applied Linguistics (System) 2009;37:700-7. Moafian F, Ghanizadeh A. The relationship between Iranian EFL teachers′ emotional intelligence and their self-efficacy in Language Institutes. Journal of Faculty of Letters and Humanities (System) 2009; 37:708-18. 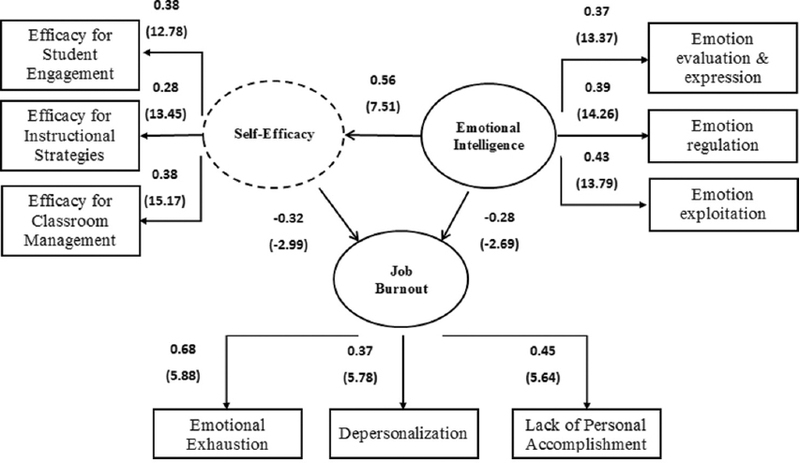 Neerpal R, Renu R. Effect of emotional intelligence on occupational self-efficacy. Icfai J Organ Behav 2008;7:46-5. Farmer S. The Relationship of Emotional Intelligence to Burnout and Job Satisfaction Among Nurses in Early Nursing Practice. University of Utah Spencers. Eccles Health Sciences Library; 2004. Maslach C, Jackson SE. Manual of the Maslach Burnout Inventory. 2 nd ed. Palo Alto, CA: Consulting Psychologists Press; 1997. Goddard RD, Tschannen-Moran M, Hoy WK. A multilevel examination of the distribution and effects of teacher trust in students and parents in urban elementary schools. Elem Sch J 2001;102:3-17. Schutte NS, Malouff JM, Hall LE, Haggerty DJ, Cooper JT, Golden CJ, et al. Development and validation of a measure of emotional intelligence. Pers Individ Dif 1998;25:167-77. Kalantari KH. Structural Equation Modeling in Economic and Social Researches. Tehran: Farhange Saba; 2009. Kareshki H. Linear Structural Relations in Human Sciences Research. Tehran: Avaye Noor; 2011. Asl NS, Fayazi M, Cholipoor A. Determining the consequences of positive psychological factors in Iran management and sciences organization 5 th year, No. 17; 2010. pp. 23-46.